There was a recent article by Joel Stein about “Nextdoor” the social networking service and requisite letters in response representing various points of view. Since one of the main goals is to keep neighbors apprised of suspicious behavior it’s not difficult to understand how people’s paranoia could get in the way. The most disturbing aspect of this dynamic is the amount of apparent racial profiling coming through many of the community posts. If I understood correctly, people in certain neighborhoods, have been reporting activities based solely on the color of an individual’s skin, with no additional particulars. There were, however, no reports of suspicious activities of white strangers observed in South Central Los Angeles. Steps are being taken to address this inequity. 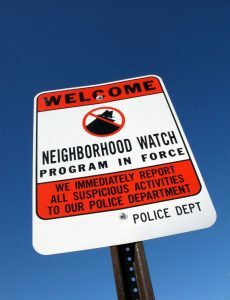 The idea of connecting neighbors is as old as the back fence and has been an important part of the real “Neighborhood Watch” the one that starts with paying attention instead of ignoring. We have no excuses for not using the phone that’s probably in our hands to call for help when you see something happening. But we need to avoid jumping to the easy conclusions. Look out for your neighbors and in LA call 1-877-ASK-LAPD for help while providing where, and why you need them with as full a description as is possible.